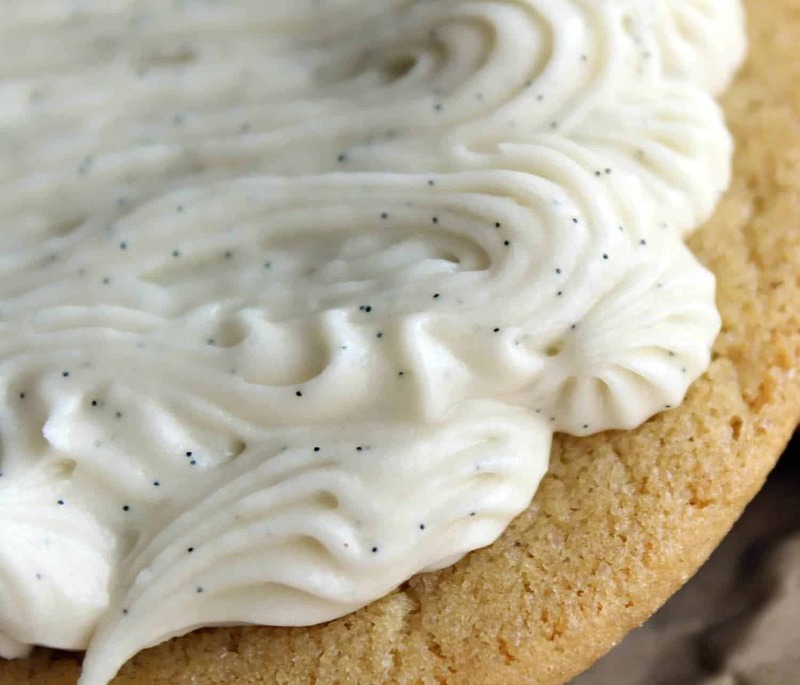 Double vanilla in this very vanilla buttercream frosting makes it completely irresistible. It’s perfect on cookies, cakes, and anything else. Remember the Spiked Irish Cream Buttercream that I made the other day? I made this the same day. I was having a buttercream party. For one. Sharing is good too though. I guess. Also, I’m not sure if you’ve noticed…but I’ve been a little obsessed with vanilla beans lately. I might have even thanked God for them on Thanksgiving. Don’t judge. I think I like this buttercream even better (gasp!) than its spiked sister. Maybe that has to do with the vanilla bean obsession. 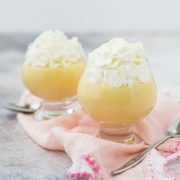 This version isn’t quite as sweet as the Irish cream frosting either–it is a more delicate muted flavor. 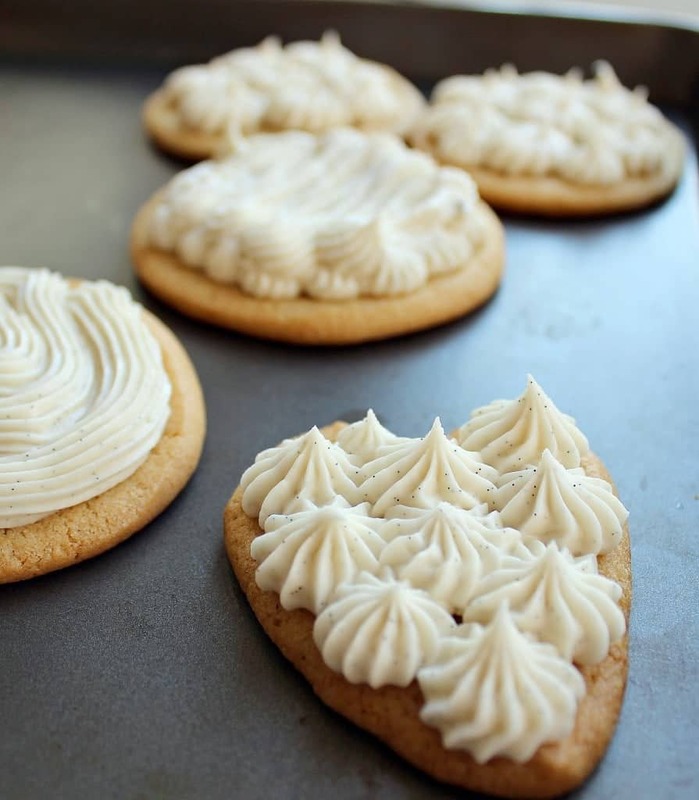 Double vanilla in this very vanilla buttercream frosting makes it completely irresistible. It's perfect on cookies, cakes, and anything else. Using an electric mixer, cream together butter, vanilla, milk and vanilla beans. One cup at a time, add in powdered sugar until you achieve desired consistency. You’ll want it a little stiffer/thicker for piping (mine was a little soft to hold its exact shape after piping). Verdict: Amazing. Love this stuff. If I could live on it and not get fat and not die–I totally would. Husband’s take: He liked this better than the Irish cream version too. But don’t get confused–that stuff rocked too. He’s a traditionalist though. Which is why I frosted the heart-shaped cookie with the vanilla frosting. I knew it would be his favorite. Now can I get that “Wife of the Year” award? Can you please send me some of this? Pretty please! 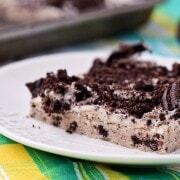 You are killing me with these fluffy frosting recipes!! The frosting with REAL vanilla beans must be so delicious! 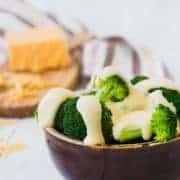 These look so yummy Rachel! Love all the black specks in your frosting. Favorited this one in my RSS for near future reference – these pictures look too fantastic. Loving the little specks of vanilla bean in the frosting. The buttercream sounds fab and I love the little flecks of the vanilla bean in it. Kinda of rustic and beautiful. Your piping is really good…so jealous. Where on earth did you get those adorable pink and black straws? They are irresistible! You are still wife of the year if you baked any cookies for the hubs AND decorated them with your homemade vanilla bean butter cream. Mmmmm. Mmm this sounds fantastic! Who cares about the cookie when you have delicious homemade frosting like this! Ok, I have never used a real vanilla bean. I know, I know. There should be a support group, right? 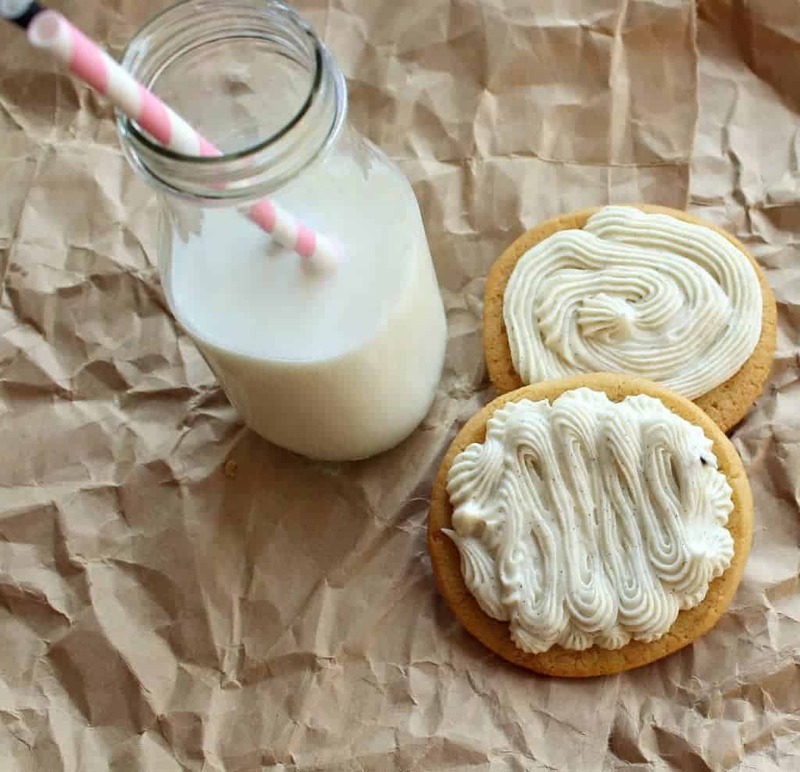 I absolutely love buttercream and I love your pics in this post! The glass milk bottle with straws is so cute! I love all the specks in this frosting! I made something similar with vanilla bean paste for my sons birthday cupcakes. I’m obsessed with vanilla beans too! Love! 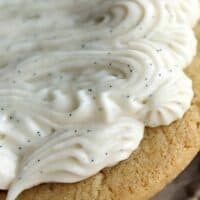 Those little specs of vanilla bean make me want to lick that right off the cookie. Yum! 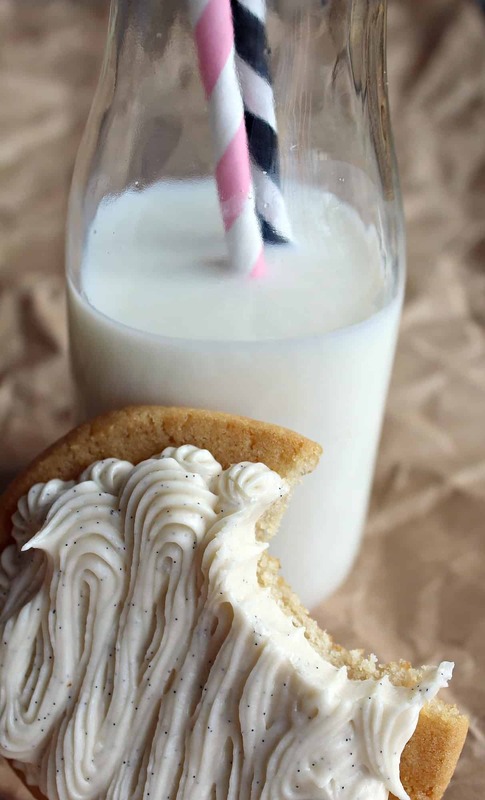 Ok, I just loooove your photo’s of the cookies with the milk jug and the adorable straws. I am going to have to get some of those straws for the kids. They look so fun! Those cookies look so pro and yummy! We just whipped up a batch of black forest cookies to share and eat and my kid’s won’t let them out the door! I’m going to add this recipe to my Holiday cookie share list. Thanks! Black forest cookies sound great! Sounds absolutely fantastic! Shocking it’s better than a spiked version too but vanilla does have a pretty amazing taste. I want some RIGHT. NOW. With my coffee. While I’m at work. Yes, I’m checking your blog at work. :) Oops!! Mmmhm, frosting. You are so funny Rachel! I was like….vessel of metal and then duh, visions of me scooping out Nutella with a spoon. Yeah, ahem…in my dreams of course ;) Love it and love your addiction to vanilla beans! I wonder if I could use that frosting as a facial moisturizer. Just making blog tripping when I my catch one of your recipe, I like making cookies muffin and cakes and this one I would love to try it and I know that is great for the holidays. perfect! i was planning on making cupcakes tmrw and I’m totally going to use this icing recipe! Vanilla is one of my all time favourite flavours – I love the little flecks of vanilla bean!